TORONTO - Another opportunity for Jonathan Bernier to reclaim a share of the Toronto Maple Leafs' crease ended in disappointment and frustration. Leafs head coach Mike Babcock grimaced behind Toronto's bench when Brayden Schenn's shot attempt trickled past Bernier's glove 57 seconds into the second period. It was the rather abrupt end to Bernier's Saturday evening. Babcock called immediately for James Reimer to replace the 27-year-old Bernier, who gave up three goals on just 13 shots. Bernier has not registered a victory since Jan. 6, a string of seven starts. "I wasn't good enough," Bernier said after the Leafs' 5-4 overtime loss to the Flyers. "I didn't make the big saves." It was another opportunity gone awry for Bernier. He was getting a rare chance to start back-to-back games with Reimer struggling, but as has been the case for most of the season, he could not string together a strong case to earn more playing time. Saturday's quick exit followed a Thursday night performance against the Rangers when Bernier gave up three goals on 19 shots in a 4-2 Toronto loss. Asked if he was surprised to be pulled with less than a minute gone by in the middle period against on Saturday Bernier responded, "It's not my decision." Babcock made it clear earlier this week that he was giving Bernier another chance at reclaiming a greater stake in the net with Reimer scuffling for the first time since grabbing hold of the No. 1 job. His frustration was evident that such an opportunity was not grabbed following the loss to Philadelphia, the 15th in the past 19 games for Toronto. "If you don't do your job someone else is getting (it)," Babcock said. "That's just the way it is. That's the way life is. It's hard. In some jobs they don't report it in the paper, in our job they report it in the paper." Standing in for Bernier, Reimer allowed two goals on 15 shots, including the overtime winner to Shayne Gostisbehere, who extended his Philadelphia (26-21-11) rookie record scoring streak to 15 games. 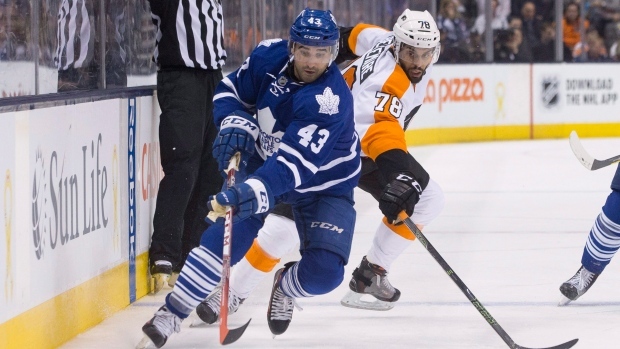 The Leafs and Flyers traded goals and leads through much of the night, Toronto overcoming a 3-1 deficit with three straight goals, including the first in more than a year from Nick Spaling. Matt Read evened the score at 4-4 with less than five minutes remaining in regulation. Shawn Matthias, Peter Holland and Byron Froese also scored for the Leafs (20-27-10), who sit last in the NHL with 50 points. Bernier's third season in Toronto started poorly and hasn't gotten much better. He gave up a goal to Max Pacioretty on the very first shot of the season, losing his first 11 starts of the campaign (0-8-3) before finally winning for the first time on Dec. 19. Bernier seemed to be turning a corner early in 2016 when he stopped 79 of 80 over consecutive starts against the Blues and Ducks, the latter a 39-shutout which stands as his last victory. He finished January with an impressive .935 save percentage, only to sink back to previous lows this month. He holds the second-worst save percentage in the league currently (.895) — only Calgary's Jonas Hiller has fared worse — and the worst mark at even-strength among goaltenders with at least 20 starts (.901). Barring an injury, trade or continued struggles from Reimer, another opportunity such as this seems unlikely for the remainder of the season. Bernier has one year remaining on a two-year contract inked just before an arbitration ruling last summer. He acknowledged that another opportunity had slipped through his grasp. "Yes I guess, but that's not the end of the world," said Bernier, noticeably disappointed. "I've just got to stick with it. I thought my game's been better. Tonight wasn't my game, but I've got to turn the page."